Human services planning for crews who go to Mars is in its earliest phase, but the modalities for service delivery are well worth anticipating because they could involve some of the first innovations that merge physical, biological, and digital capacities on the new planet. 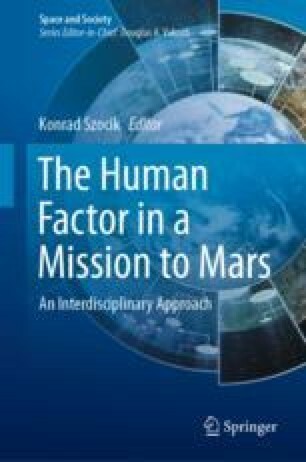 This chapter examines the constraints of the planet Mars, itself, on all humans. It anticipates how “exogenous stressors” (gravity, atmosphere, radiation, light, and dust) might affect the psychological, social, and cultural capacities and conflicts of the earliest crews. Several types of service modalities are explored: hibernation; medication management; traditional psychotherapy; long-distance modalities to approximate the “talking cure”; digitized, keyed psychology workbooks; robotics, or service delivery without verbal feedback; AI technologies, or service delivery with verbal feedback; problem-solving at the cultural level; digital bulletin boards to substitute for journaling; and a special section on the issue of privacy. The chapter rounds out with a section, on types of spiritual services that may be beneficial even for those who profess no faith. We focus on “sacred space,” and on death and burial ritual on Mars. Factors explored here reflect the backgrounds of the two authors: one, a cultural anthropologist and biologist, and the other, an astronomer who is also a Catholic priest. Holland, P. (2018). ‘My Special Aflac Duck’ is a robot to help kids with cancer. Retrieved June 19, 2018, from https://www.cnet.com/news/my-special-aflac-duck-robot-helps-kids-through-cancer/. Newman, A. (2016). Therapy cats for dementia patients, batteries included. https://www.nytimes.com/2016/12/15/nyregion/robotic-therapy-cats-dementia.html; Oviedo, L. (2019). Raising the right questions. In this volume.